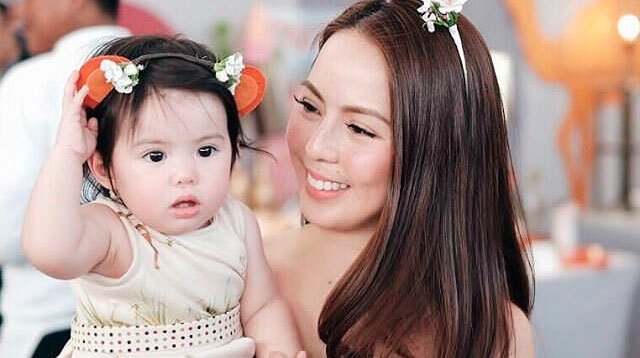 Olivia Manzano Reyes, Andi Manzano and hubby GP Reyes' daughter, just celebrated her first birthday over the weekend. Baby Olivia had a massive first bash at the Palace Pool Club (thanks to club owner daddy GP) with wild animal-themed décor. Look at that photo wall! Wiiiiild. Events stylist Teddy Manuel opted for printed table cloths for the kids. How cute are those ceiling cutouts? OMG! Are those real goats? Olivia's guests treated themselves to unlimited cotton candy. There was also an organic coffee booth for the adults! The cupcakes were literally too pretty to eat. Daddy GP snapped this photo of Olivia on her unicorn. Talk about making an entrance! Olivia even got to pet a snake! Blowing her first birthday candle! All smiles with Team Kramer. Too too cute! Happy Birthday, Baby O!